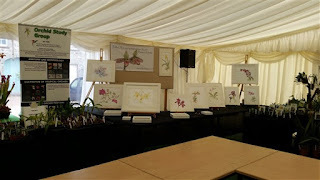 The Welsh Orchid Festival was, as usual, a whirlwind of flowers, scent and people. So many lovely orchids in one place, and so many orchid lovers too. We seem to have got our painting transportation down to a fine art now and the stand quickly took shape. This year, as I was tucked away in a far corner, I got a banner made so that people knew I was there and who I was. I had cards of some of my paintings printed and they were very well received. More designs are planned for the new year. Also this year, children were showing an interest in the orchids and it's so good to see young people being enthusiastic about plants. Two young men of about seven or eight years became fascinated by my sketching and painting some Orchids and were most disappointed that there were no paper and paints for them to try it too. We had a lovely chat about what I was painting and why, which bits were important, how and why I was measuring the plants and why the colours had to be matched exactly. They were really very interested indeed and wondered if they would be able to do something like that. I love that almost every child is an artist! In the midst of it all my lovely friend Claire Ward popped in for a chat. So nice to see her as we live on opposite sides of Wales! for these. Paphiopedalum Black Jack, a baby Paphiopedilum St Swithin and Phalaenopsis Mini Mark also came home with me, but I bought these. The living room now looks like a flower shop./Orchid nursery! 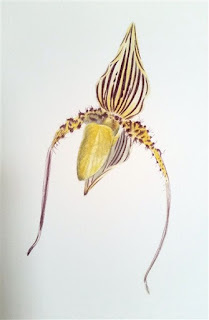 I was also given Orchids to paint again this year, a flower of Paphiopedilum St Swithin gratefully received from Andrew Bannister of Orchid Alchemy, and a whole plant - Stanhopea tigrina, on loan from Alan Gregg of Singleton Botanical Garden Swansea, so as usual it was a race against time in the coming days to record these lovelies before they wilted. I wasn't the only artist at the show though. Paul Steer of Art in a Corner had a stand with his amazing watercolour frescoes of landscapes, butterflies and other nature inspired subjects. It's fascinating how many different ways there are to portray similar subjects and Paul has a most original way of looking at the world and then letting us glimpse his vision. 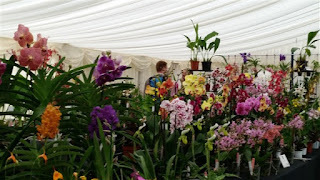 It was wonderful to see you both Claire, and yes - total Orchid Heaven!